Tom Francis, by day a writer at PC Gamer, is by night the main man behind Gunpoint, an upcoming stealth game for the PC which I've been playing for the last few days (and looking forward to for the last few months). Gunpoint is, like last year's Mark of the Ninja, less of a blockbuster adventure and more of a sneaky sandbox, with the potential for multiple replays to get that "perfect" run, something I ended up doing a lot of. Call it "S Rank" addiction in a trenchcoat. 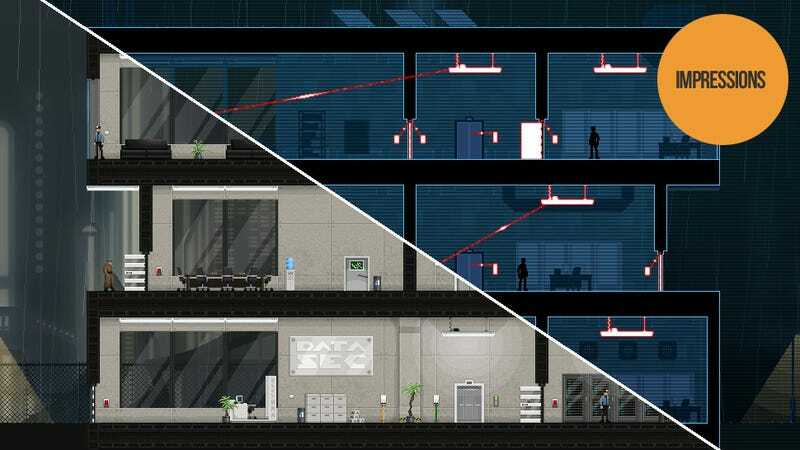 Stripped to a 2D vantage point, the game isn't just about crawling around on walls avoiding cameras and guards. Instead, you're given the power to rewire the buildings each mission takes place in. If anything in the building draws electricity - be it a lightswitch, light fitting, door, trapdoor, security camera or access panel - its purpose and end function can be modified by the player. Lightswitches can become door keys. Security cameras become a means to activate booby traps. This turns your sneaking into something of a puzzle game, as you're not only watching guard patrols and making sure you're out of sight, but that you're constantly checking the building to see how you can best make use of the technology available. And you have to use it. Combat in Gunpoint is limited; you can pounce on lightly-armed guards and knock them out, and have a gun you can sort of use later on, but if you're spotted at all, you'll be fired upon, and one shot will kill you. Which sounds rough, but in a neat touch the game is constantly saving your progress, to the point where upon death you can reload from one second ago, four seconds, six seconds, etc. It's a fantastic way to keep the game tough, but also encourage experimentation without forcing you to backtrack and repeat stuff. I've played my way through a few of the missions in a preview build for the game, and have loved it. The art style keeps things nice and clean, and the noir detective soundtrack is great. Many of the puzzles seem clever without being too obtuse, there's a good ramping up of new tech and obstacles to try out, and the lure of replaying each level to increase your rank is a strong one. I can't wait to try out the finished version, which shouldn't be too far off, especially since it looks like it'll be shipping with a full mission editing suite. It'll be awesome seeing what people can come up with once they get their heads around the rewiring systems.